Germany: Day 1 of 2 of the Beer Hall Putsch. The Nazi Party seeks to take over the Bavarian government, but fails and Hitler will serve 9 months in prison where he will write Mein Kampf. CBI - China: Day 52 of 154 of the Japanese Invasion of Manchuria. Spain: Day 115 of 985 of the Spanish Civil War. CBI - China: Day 20 of 29 of the 1st Battle of Suiyuan. Germany: The traveling anti-semitic propaganda exhibition Eternal Jew opens in Munich. The Nazis took great pains to "educate" the population in anti-Semitism. 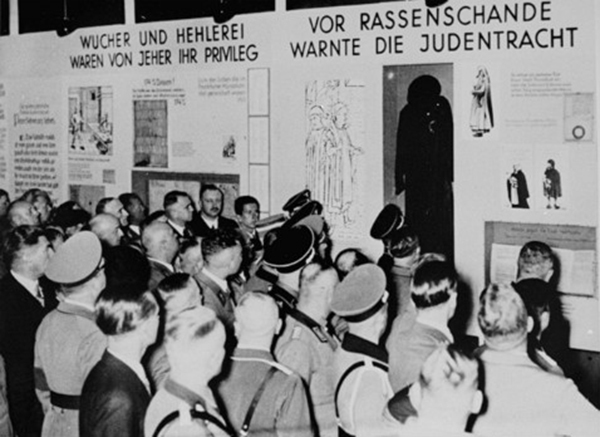 The traveling exhibition promoted stereotypes of Jews and Nazi perceptions of their danger to the world. Officials shown above are gazing at a segment entitled, "Jewish dress was a warning against racial defilement." To the left is a segment entitled, "Usury and the fencing of goods were always their privilege." Later, in 1939-40, Nazi Propaganda Minister Goebbels commissioned the notorious film of the same name, "Der Ewige Jude," which used footage of Jews suffering in the Warsaw Ghetto intercut with scenes of rats to show that Jews "differ from us in body, but especially in soul." The film was blatant propaganda that conveyed Nazi sentiment in documentary format. It was a box office flop in Germany. 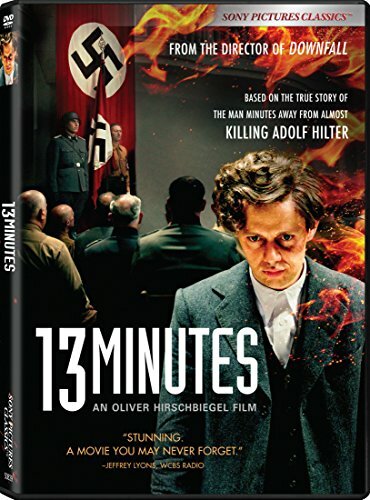 Subsequent Nazi films switched to a more palatable "entertainment" format to successfully convey the same ideology of hate that would sell well at the box office. Spain: Day 480 of 985 of the Spanish Civil War. CBI - China: Day 125 of 2,987 of the 2nd Sino-Japanese War. Day 88 of 106 of the 2nd Battle of Shanghai. Day 69 of 70 of the Battle of Taiyuan. Spain: Day 845 of 985 of the Spanish Civil War. CBI - China: Day 490 of 2,987 of the 2nd Sino-Japanese War. Day 28 of 81 of Japan's Operation GUANGDONG. ETO - Germany: A bomb intended to kill Hitler explodes at the annual meeting of the veterans of the 1923 Nazi Beer Hall Putsch in Munich, but the Führer had already left the beer cellar. CBI - China: Day 855 of 2,987 of the 2nd Sino-Japanese War. ETO - UK: Day 64 of 258 of the Blitz. The RAF bombs Munich shortly after Hitler had appeared there. MTO - Albania: Italians launch a big offensive into the Balkan states from Albania. East Africa: Day 152 of 537 of Italy's East African campaign in the lands south of Egypt. CBI - China: Day 1,221 of 2,987 of the 2nd Sino-Japanese War. Day 360 of 381 of the Battle of South Guangxi. CBI - Thailand: Day 39 of 221 of the Franco-Thai War (Vichy France vs Thailand). Russian Front - Finland: Day 133 of 142 of Operation SILVER FOX, a joint German-Finnish campaign to capture the Russian port of Murmansk in the Arctic. Russian Front - Finland: Day 131 of 140 of Operation ARCTIC FOX, a joint German-Finnish campaign against Soviet Northern Front defenses at Salla, Finland. Russian Front - Finland: Day 140 of 164 of the Battle of Hanko. The Soviets will be forced off their leased naval base. Russian Front: Day 140 of 167 of Germany's Operation BARBAROSSA. Hitler claims that Soviet losses are between 8 and 10 million, which is perhaps double the real truth. Russian Front - North: Day 62 of 872 of the Siege of Leningrad. German troops advance across the Volkhov river and capture Tikhivin. Russian Front - Center: Day 38 of 98 of the Battle of Moscow. Russian Front - South: Day 10 of 248 of the Siege of Sevastopol, Crimean Peninsula. MTO - Libya: Day 213 of 256 of the Siege of Tobruk. East Africa: Day 517 of 537 of Italy's East African campaign in the lands south of Egypt. CBI - China: Day 1,586 of 2,987 of the 2nd Sino-Japanese War. USA: The hull is laid in the Kaiser Richmond Shipyards, California, for the Liberty Ship SS ROBERT E PEARY, which will be completed in a record time of 4 days, 15 hours, and 29 minutes. UK: Purchased from RCA in America, a powerful 500 KW radio transmitter codenamed Aspidistra becomes operational and begins broadcasting Allied propaganda on German controlled wavelengths. ETO - France: US 8th Air Force heavy bombers hit two targets in France. Russian Front - North: Day 427 of 872 of the Siege of Leningrad. Russian Front - North: Day 188 of 658 of the Siege of the Kholm Pocket, USSR lays siege to the Kholm Pocket but the Germans hold out for a about a year and a half. Russian Front - South: Day 134 of 150 of Germany's CASE BLUE, the failed offensive to take the Caucasus oil fields. Russian Front - South: Day 78 of 165 of the Battle of Stalingrad, bloodiest battle in human history. MTO - Egypt: Day 17 of 20 of the 2nd Battle of El Alamein. MTO - North Africa: Day 1 of 9 of Operation TORCH, the invasion of North Africa. Allied troops land in Morocco and Algeria. CBI - China: Day 1,951 of 2,987 of the 2nd Sino-Japanese War. PTO - Alaska: Day 155 of 435 of the Battle of Kiska, Aleutian Islands. The US and Canada will defeat the Japanese invaders. PTO - Malaya: Day 263 of 357 of the Battle of Timor Island, a long guerrilla war ending in Japanese victory. PTO - New Guinea: Day 111 of 119 of the Battle of the Kokoda Track. The Australians continue pushing back the Japanese troops. PTO - Solomon Islands: Day 94 of 187 of the Battle of Guadalcanal. Russian Front - North: Day 792 of 872 of the Siege of Leningrad. Russian Front - North: Day 553 of 658 of the Siege of the Kholm Pocket. USSR lays siege to the Kholm Pocket but the Germans hold out for a about a year and a half. Russian Front - South: Day 77 of 122 of the Battle of the Lower Dnieper River, USSR. Russian Front - South: Day 6 of 10 of the 2nd Battle of Kiev, Ukraine. MTO - Italy: During a winter storm, flight nurses and medics from the 807th Medical Air Evacuation Transport Squadron crash-land in a Douglas C-53 transport in Nazi-occupied Albania and begin a dangerous 800-mile trek to freedom. Aided by Albanian partisans, the 29 Americans won't make it back to Italy until 21 Mar 44, after months behind enemy lines. MTO - Italy: The British 8th Army gains the heights on the Sangro less than 100 miles East of Rome. US 12th and 15th Air Forces provides air support for the Allied ground troops. CBI - China: Day 2,316 of 2,987 of the 2nd Sino-Japanese War. Day 7 of 49 of the Battle of West Changde. PTO - New Guinea: Day 51 of 219 of the Battle of Shaggy Ridge. PTO - New Guinea: Day 48 of 162 of the Battle of the Huon Peninsula. PTO - New Guinea: Day 7 of 10 of the Bombing of Rabaul, a joint US, Australian and New Zealand carrier and land-based attack on the Japanese cruiser force at the naval base at New Britain. PTO - Solomon Islands: Day 8 of 295 of the Battle of the Bougainville Islands. ETO - France: Day 100 of 284 of the Battle of Brittany. ETO - Belgium: Day 38 of 38 of the Battle of the Scheldt Estuary. The Canadians really shine as they are mainly responsible for winning this extremely tough battle. ETO - France: Day 55 of 236 of the Siege of Dunkirk. ETO - Germany: Day 51 of 145 of the Battle of Hürtgen Forest. ETO - Germany: US 8th Air Force heavy bombers attack targets in Germany. Russian Front - Finland: Day 55 of 223 of the Lapland War. Finland and Russia have joined forces to kick the Germans out of Finland's most northern province. Russian Front - Center: Day 25 of 206 of the Battle of the Courland Pocket in Latvia. Russian Front - Center: Day 18 of 99 of the Siege of Memel, a border town of Lithuania and East Prussia. Russian Front - Center: Day 56 of 72 of the Battle into East Prussia and northern Poland. Russian Front - South: Day 11 of 108 of the Battle of Budapest, Hungary. 25,000 Jews are forced to walk over from Budapest to the Mauthausen Concentration camp. They will be followed by another wave of 50,000. Russian Front - South: Day 56 of 72 of the Battle of Belgrade, Yugoslavia. MTO - Yugoslavia: US 15th Air Force B-24s bomb troop concentrations at Mitrovica, Prijepolje, and Sjenica. CBI - Burma: Day 222 of 302 of the Chinese Salween Offensive in Burma. CBI - China: Day 2,682 of 2,987 of the 2nd Sino-Japanese War. Day 206 of 259 of Japan's Operation ICHI-GO. PTO - New Guinea: Day 317 of 597 of the Battle of New Britain. PTO - New Guinea: Day 201 of 481 of the Battle of Western New Guinea. PTO - Palau Islands: Day 55 of 74 of the Battle of Peleliu (Operation STALEMATE II). PTO - Philippines: Day 20 of 299 of the 2nd Battle of the Philippines, aka the Liberation of the Philippines or the Philippines Campaign. PTO - Philippines: Day 20 of 73 of the Battle of Leyte.